ROME – Both Inter Milan and Napoli claimed hard-fought draws against Barcelona and PSG, respectively, in the Champions League group stage on Tuesday. In a high-quality contest, Napoli and PSG shared the spoils with a 1-1 draw in Naples, leaving Group C tantalisingly poised after four of the six group matches. The record-breaking French giants, having won each of their first 12 Ligue 1 games, started the game brightly and duly found the breakthrough on the stroke of half-time. A cut-back from Kylian Mbappe was finished by an onrushing Juan Bernat, as the Napoli defence were caught somewhat unawares. The Italian side fought back after the break but were foiled time and again by former Juventus stalwart Gianluigi Buffon, who made numerous top-class saves. However, a foul from Thiago Silva on Jose Callejon gave Napoli a penalty in the 62nd minute, which was emphatically finished by Lorenzo Insigne. Both sides didn’t let up in their search for a winner in the last third of the game, but neither managed to find an opening and had to settle for a draw. Liverpool’s shock defeat to Red Star Belgrade earlier in the evening means just two points now separate the four teams in Group C with just two rounds of fixtures to go. Napoli will hope to take three points in a few weeks’ time when they face Red Star, with a potentially crucial final fixture against Liverpool coming in December. Inter Milan’s route to the last 16 looks a little less perilous, having snatched a point against a Messi-less Barcelona. The Argentinian, injured for the side’s previous game, was on the side-lines again at the San Siro. Barcelona didn’t seem devoid of attacking prowess without him, however, as Luis Suarez led the line adeptly, seeing a number of chances saved and one goal disallowed. It took substitute Malcolm to open the scoring late in the game, a lovely strike from 20 yards finding the bottom left corner. 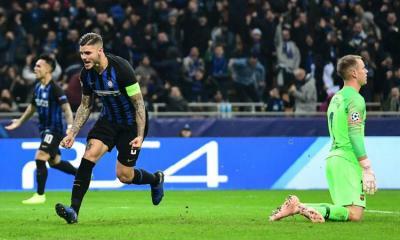 However, Inter struck back quickly, against the run of play, as Mauro Icardi continued his fine form with a well-taken strike in the 87th minute. The equaliser proved very significant for Inter’s qualification chances, as a point against Tottenham at the end of November will be enough to secure their place in the last 16 with a game to spare.